Today, I like to start a new series on 40+ style where I show you how to wear your style icon’s style. I think it’s good to keep track of a few style icons you admire. Women that inspire you in your dressing can give you new ideas on how to wear your clothing and inspire you to try something new. They can also give you clues about your own style. What is it about a person’s style that you find so appealing? The clearer you get about your own style and the direction you want to take it, the fewer buying mistakes you will make and the happier you will get with your own style. 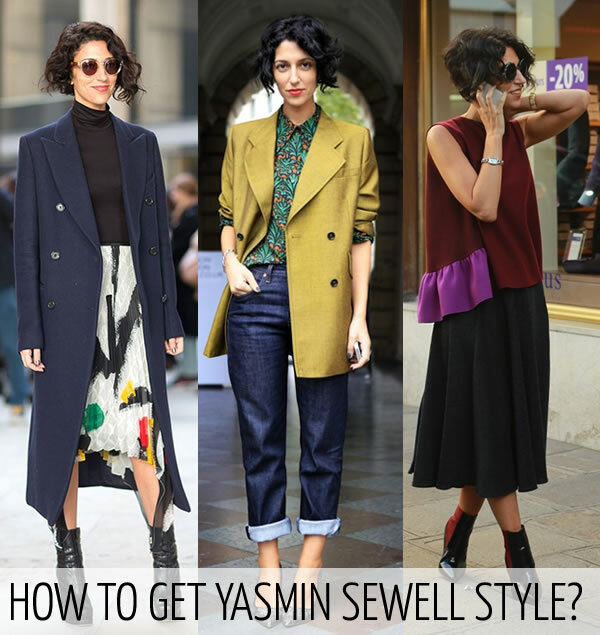 One of my style icons is fashion consultant Yasmin Sewell. I find her style innovative, fashion forward, elegant, arty and unconventional, all of which appeal to me. In fact Barney’s was so impressed with her style that they arranged her to design her own collection, esclusively for Barney’s. Yasmin often wears knee high or over the knee skirts. Often with blousy tops which are kept short enough so that a waist is still seen or suggested. She enjoys wearing tops with a bolder statement. If her look is neutral, the emphasis will be on her shoes. Yasmin is a master at combining the androgynous with the feminine. Shoes play an important part in that, but she also always creates the right balance in an outfit. I look forward to seeing Yasmin’s outfits at the coming fashion weeks and I’m sure she will inspire me big time! I will keep track of her outfits on a special Pinterest board: Style crush Yasmin Sewell. If you like her style as much as I do, be sure to follow that. Here are some Yasmin Sewell inspired clothes you can buy in stores right now. 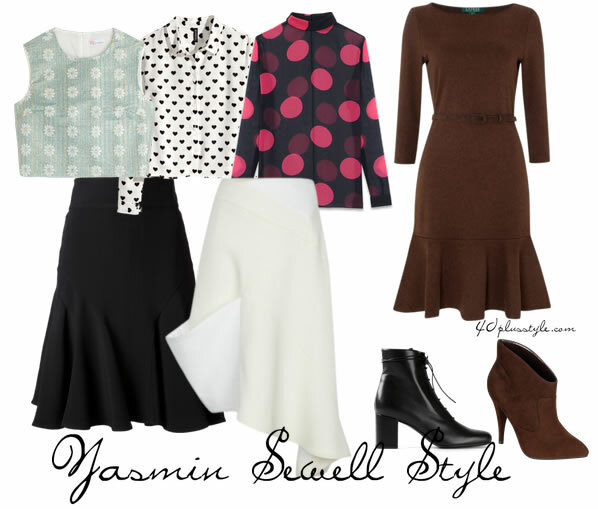 This coming Monday I will feature an outfit of my own that was inspired by Yasmin. If you have a style icon, you would love me to feature in this series, let me know! 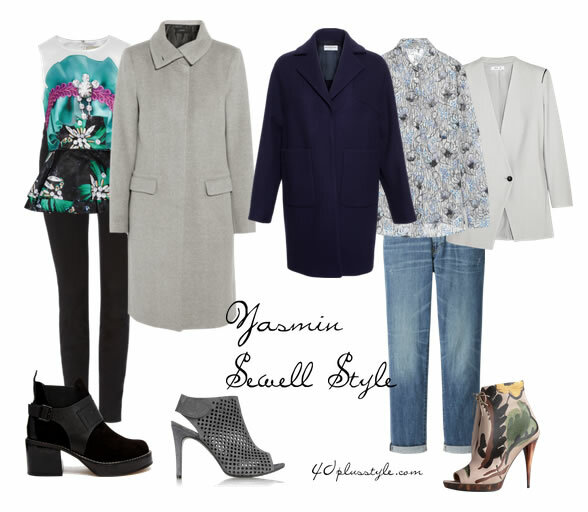 What do you think of Yasmin’s style? Are you inspired by it? For sources of the images at the top, please check my Pinterest Board. gorgeous style! fantastic colors and prints! to make this how-to-feature a series is a great idea!!!!! Thank Beate. Glad you like the idea! Definitely my style, despite the fact that I’m 70 and petite! Thank you for your wonderful fashion blog–the most instructional, thoughtful, forward-looking, and consistently helpful I have read. Thank you for your kind feedback Elisa! Excellent style! Love the skirts and shoes especially. Also the structure of each piece seems important and these clothes fit beautifully. I think her hair is a key to her look. Yes, structure is important which is also important to my style and I agree, just love her hair! Don’t you just love her?! I certainly do. Thanks for a great post. Yes very true. Yasmine is ideal for me because I could wear almost anything she wears. Sure, feel free to link! Thanks and enjoy your weekend! Lovely woman, lovely looks! I wish I would have her looks. I am sorry but this just doesn’t work for me. I neither have the body nor the budget of this gorgeous woman. Of course I know you are going to tell me to get inspired, not to copy. Still, that doesn’t work. I cannot see it, so I will copy which will give me many mistakes. Well, what can I say now then haha? I noticed that you have started to do some of the exercizes in the style course. That will definitely work as you really start to learn what works for you! And, huh, I have that haircut, but my hair doesn’t look like that! It’s all in the product. Love her hair 🙂 I can see how you would be attracted to her style Sylvia. I’m with Greetje on this tho 😉 as I don’t have the body shape (or the budget!). I love Audrey Hepburn’s style, although I wonder how to work it into an “apple’s” body?! Well, I still stand by my view that you can take inspiration for yourself from anybody that inspires you. No matter if she has a different body or has more expensive clothes. Find the elements of someone’s style that you like, read the guidelines for your horizontal and vertical body type and learn how to modify those elements for your shape and then start experimenting! Have to find someone who measures me properly. On my own I am no good doing this. So I still don’t know my vertical body type. 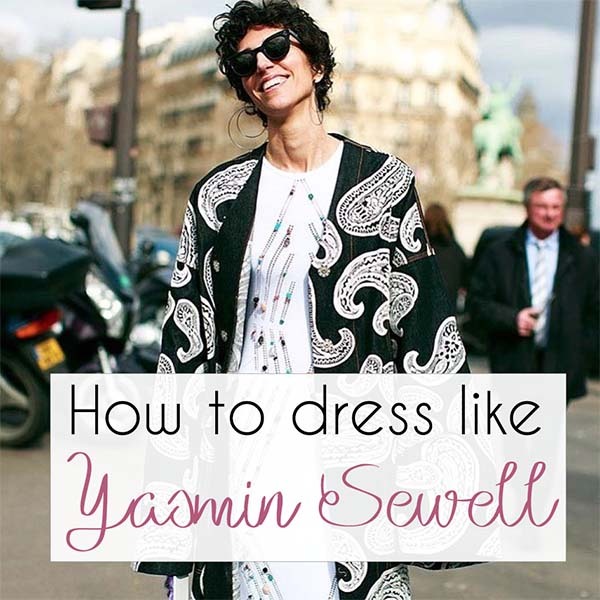 But… (question): if I don’t know what body type Yasmin is, how would I know what she is wearing? The dimensions of what she is wearing might be completely different from mine. I made this mistake before: a tiny, skinny girl with an boyfriend jacket “sold” me to buy mine, which has a totally different effect on me. Ron? Or just use a centimeter. Also check my intro for unit 5 in the style course. Wendi shared a great idea to create a contour of your body which would give you a 2d model to work with. Why is her body size important? First ask yourself, what is it that appeals to you from the outfit. Is it the color combination? The cut? The way she combines it? Color is easy, you can look for something similar. For cut, you can refer to you shape guidelines if that would work for you. Then, you could try it out with clothes in your own closet. See what works and see what you need to adjust. Perhaps you have a similar outfit, but the top is too long for it to work on your body. Test the idea in the shop with a shorter top. Don’t let anybody ‘sell’ you anything. YOU should learn and know what suits you. Only you will know best. And you will only find out if you start experimenting with silhouettes and balance as explained in the last 2 lessons. Take pictures the way I showed you in unit 5, with different top lengths, different widths etc. Practice makes perfect! I am learning so much from you this week Sylvia! (A lot more than just style tips.) Thank you for introducing us to Yasmin Sewell. She is a colorful inspiration. Thank you so much Susan. So great to read that you enjoy the course and find it helpful! An eclectic look on an exotic woman. Fantastic! I will follow your board to get inspiration for my own work in progress style. Thanks for sharing this Sylvia. I think she looks beautiful, but I’m not sure that this would work for my body type at all. Anything boxy would just make me look heavier. I think I need to stay with a defined waist. So in this instance, I will admire at a distance, but not try to emulate. Next post: Why you should wear your nicer clothes for casual occasions too!